Catalog Home > Classroom Collections > Schoolgirl Style™ Twinkle Twinkle You’re a Star! Celebrate students' birthdays in style with this colorful birthday bulletin board set! 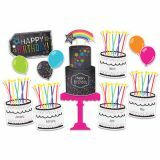 This festive set features brilliant pops of birthday cheer against a chalkboard background. 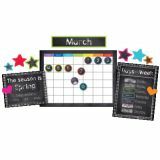 Help students stay up-to-date with months, seasons, and holidays with this eye-catching calendar bulletin board set! This set helps students keep track of weather. Your classroom's style will reach new heights with Twinkle Twinkle You're A STAR! cut-outs! The Twinkle Twinkle You're A STAR! 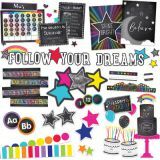 Chalkboard Stars Colorful Cut-Outs® set includes 36 stars (5.4" x 5") in assorted patterns (polka dots, stripes, stars, and white) that can be used as game pieces, accents, labels, and more. The brightly shining Twinkle Twinkle You're A STAR! 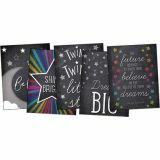 collection features brilliant pops of color against a chalkboard background for an inspirational style that will motivate students to reach for the stars! 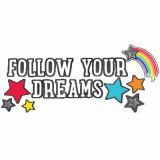 Schoolgirl Style™'s motivational charts are the ideal decoration for adding visual interest to any area of your classroom. These all-purpose posters are perfect to both decorate and motivate. The Twinkle Twinkle You're A Star! collection is perfect for adding vibrant colors to your classroom. Dress up your learning space with multipurpose classroom décor and cut-outs! Inspire students to reach for the stars and beyond with the brightly shining Twinkle Twinkle You're A STAR! Collection, featuring brilliant pops of color. The Twinkle Twinkle You're A STAR! 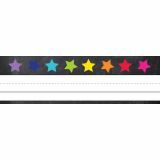 Color Stars Colorful Cut-Outs® set includes 36 stars (5.4" x 5") in assorted colors (orange, dark blue, pink, purple, red, yellow, green, and light blue) that can be used as accents, labels, game pieces, and more. Encourage students year-round with a motivational bulletin board set. Inspire students to reach for the stars and beyond with the Twinkle Twinkle You're A Star! and its motivational classroom décor! 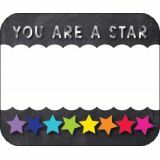 Label and assign desks and cubbies with Twinkle Twinkle You're A Star! desk nameplates. The Twinkle Twinkle You're A Star! desk nameplates for students provide an easy way to label and organize your classroom. This pack includes 36 desk nameplates—each featuring bright star accents and measuring 9.5" x 2.875". The Twinkle Twinkle You're A Star! Painted Dots straight border trim for bulletin boards enhances message displays with a classic style. Give your bulletin board displays a classic look with simple and stylish border trim. Each of the Twinkle Twinkle You're A Star! Painted Dots straight borders features black dots scattered across a white backdrop for an artistic style. The pack includes 12 border strips, each measuring 3' x 3" for a total length of 36'. Highlight classroom displays with cheerful classroom borders. Give your bulletin board displays the perfect finishing touch with eye-catching border trim! Each of the Twinkle Twinkle You're A Star! 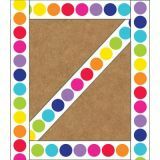 Rainbow Big Dots straight borders features a line of bright dots on a crisp white background. The pack includes 12 border strips, each measuring 3' x 3" for a total length of 36'. The Twinkle Twinkle You're A Star! 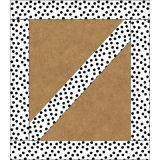 straight borders will add a stylish touch to classroom displays, message boards, bulletin board sets, and more. Enhance your bulletin board displays and message boards with bold border trim! Each of the Twinkle Twinkle You're A Star! 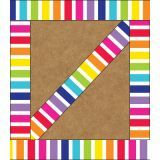 Vertical Rainbow Stripes straight borders features emphatic, bright stripes for a dazzling look. The pack includes 12 border strips, each measuring 3' x 3" for a total length of 36'.